Life Alert News: What to do if you become as cooked as your turkey. Most of us know a recipe or two by heart --- a little something to whip up at a moment’s notice when a party invitation gets lost in the mail and the host calls to see what you’re bring to dinner that night. If there are no recipes in your culinary repertoire, then there are all kinds of books, websites, blogs and even a dedicated TV network on how to cook a great dish in minutes. Recipes abound everywhere this time of year for all kinds of holiday festivities. However, in a mad rush on how to intensify the flavor of turkey through deep-frying, or how to spice up the pumpkin pie without burning it, or how to arrange an authentic Thanksgiving table with pilgrim dressing and Native American pudding, you can easily forget the most important ingredient to the holidays – YOU! Sometimes we unintentionally over exhaust ourselves leaving us vulnerable to stress-related illnesses like a heart attack, stroke, and even a fall. 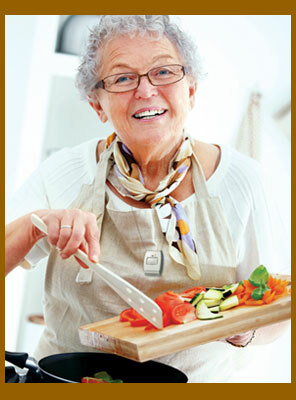 To avoid being as cooked as your holiday turkey, wrap yourself in Life Alert’s 24/7 Protection. Life Alert’s 24/7 Protection is a specialized medical alert service that provides you with three areas of personal protection. First, there’s the original, “Help! I’ve fallen and I can’t get up” service. This includes a two-way monitor and lightweight, waterproof pendant that can be used for any home emergency in case the potatoes aren’t the only ones that get mashed. Simply press the emergency pendant you wear around your neck or on your wrist anytime there’s a home emergency and Life Alert will send help fast, 24/7. You don’t even need to use your phone. Next you have your choice of two extra side dishes of protection. There’s Life Alert’s monitored CO Gas Protection which, upon detecting dangerous CO levels, will sound its siren to warn you. Much like Aunt Betty’s prune salad, this system has an added benefit that other alarms don’t have. It’s monitored, so when the alarm goes off it sends a signal to the monitoring center where dispatchers will call you and send help, if needed. And just in case your stove gets as over-heated as you during the holidays, there’s Life Alert’s Monitored Fire Protection that not only sounds an alarm upon detecting fire or smoke, it also sends a signal to the team of dispatchers, who send help whether you’re home or not. Or, if you prefer your personal protection to be on the go like you, there’s Life Alert’s HELP Phone. This small mobile protection is perfect for those moments when you find yourself needing help when the road becomes as jumbled as a chex mix party bowl. Just press the big, red, button on the phone and 911 will be called immediately. More importantly, you don’t have to worry about the cost of your protection being as expansive as the elastic waistband on those holiday pants you wear once a year. Life Alert’s 24/7 protection is less than all the fix’ns on the holiday table. So this holiday season remember to be as laid back as an oyster shooter and enjoy food, family, and friends knowing that Life Alert Protection is a button press away.